I needed a rail served industry for my module 'Wolter Springs', so I had a look around commercial kits that I could possibly use. I found however that none would really fit the bill, and would need significant kit bashing to fit in the space I had planned for it. It is at an angle and therefore the building, when viewed from the top would need to be largely triangular. I therefore decided to scratch build my own warehouse. It is entirely 'made up', I don't have a specific prototype for it, but I will make sure it will look 'authentic' enough not to look unrealistic. Besides, I had several scrap bits of styrene laying about that I could use. Here are some progress pictures. This evening I've spend extending the structure , added a door and steps , re-enforced the inside of the walls and added a ledge on which the roof can be put down, and put a loading floor inside behind the doors. This will enable me to add a small amount of interior details that might be visible where the doors will be modeled open, but not the complete depth of the building. You probably will, anyway, but I strongly recommend bracing the whole structure with thick styrene rod, as without it, the structure will eventually start to twist and warp. Same thing happened to the elevators I scratchbuilt on Anson, and luckily I managed to strengthen them before it was too late. Will do Brian, but what do you recommend as the best way? Currently I only have vertical and horizontal bracing, would you say I'd need to add diagonal braces too? Could you otherwise share a picture of the Anson elevators here, so I can see what you mean? 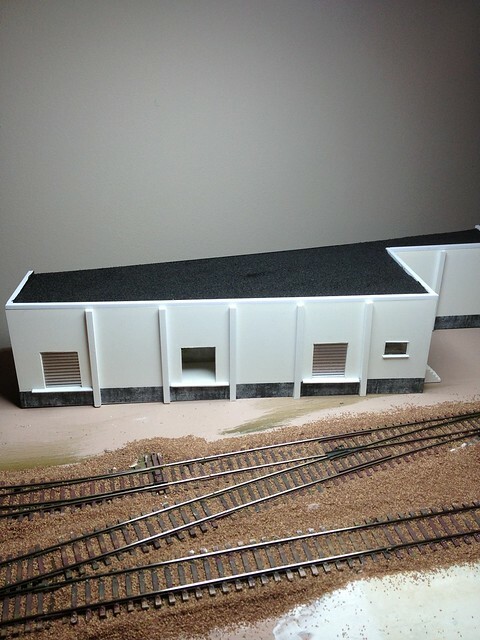 I've now added the back wall and some of the bracing that will support the roof. However before I do the roof, I want to add some interior detail and give it a basic paint coat, then I'll proceed. torikoos wrote: Will do Brian, but what do you recommend as the best way? Currently I only have vertical and horizontal bracing, would you say I'd need to add diagonal braces too? Looking at the picture, I'd also put continuous bracing around every bit of where the structure rests on the ground, as that's where it eventually will bend most. Also, some verticals every 6 or so inches at least. 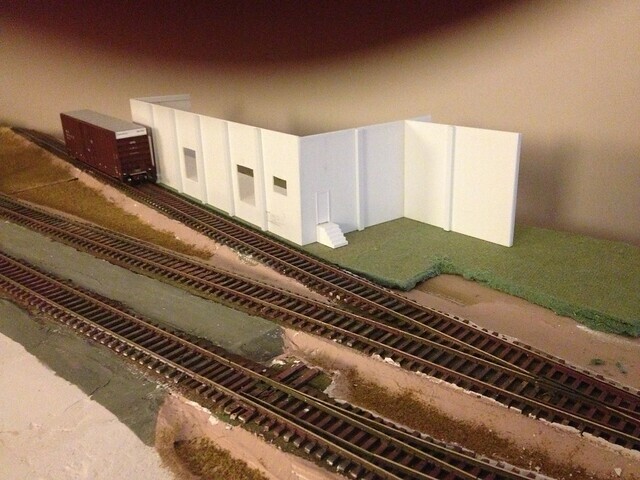 Can't give you pics of the Anson elevators, as Mike Hughes now has them on his layout. I was planning on the bottom bracing too. however I've just painted the structure a matt white as a base coat that will get rid of the plastic shine.. Then it's onwards with some more sticking and gluing, both the interior and then loading doors etc as well as a bit more bracing. After that, it's time to think about giving it a roof. This will be a flat 'asphalt' type roof. 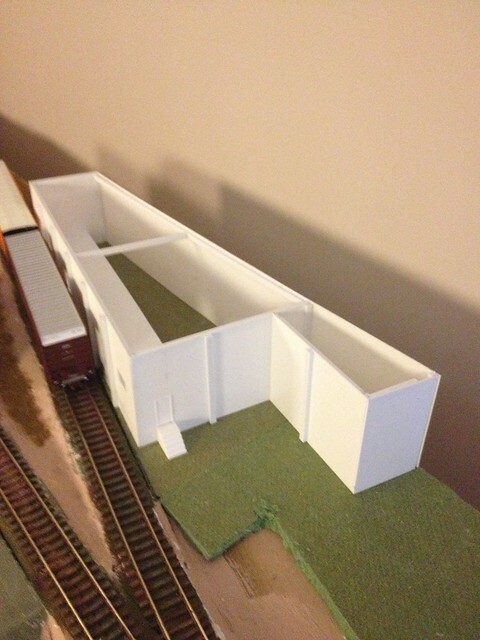 Adding some vents, ducting, airco units etc. I was able to do a little bit more without disturbing the paint on the outside (it helps that there's no roof yet). 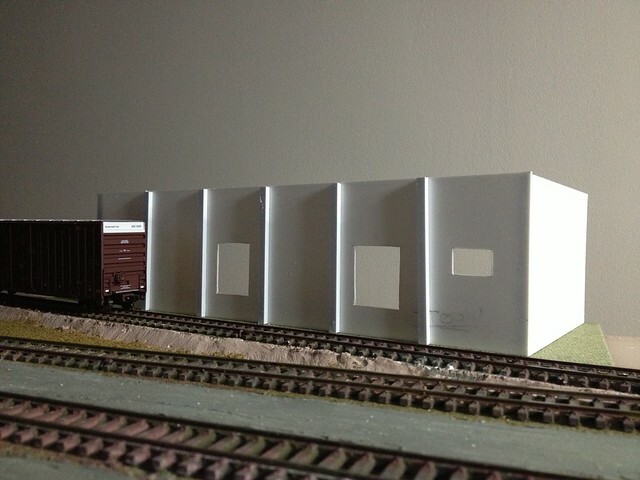 Adding a bit more interest to the open door of the warehouse , was achieved by gluing a picture of a warehouse interior, to a bit of styrene and gluing it down at about half an inch behind the door. 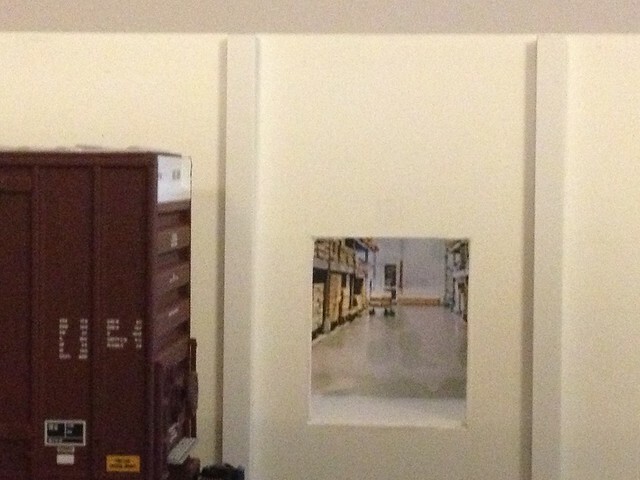 This leaves a little space in front of the picture to add some 3D details and further create the illusion of depth. Once the roof is on the building, it will get darker inside and it will only be visible through the daylight that enters the building through the loading door, further hiding the fact that this is a picture. calaf01 wrote: What, no internal lighting? I haven't made my mind up about that yet. While I like the idea, this structure remains removable from the module, and is yet another thing to power, plug in/out etc during set up etc. That's what is holding me back at present, but never say never. What about mounting two 4mm banana plugs in the building's base and then corresponding sockets in the baseboard. That would give location and power. Hi Mike, that's certainly something to think about. In any case I believe I will be able to add lighting later the way I've constructed it , it should be fairly easy. Besides I'm not going to need a lot. One LED in the area of the one open door, and another in the 'office' area would be sufficient. I am not sure if I will be adding lighting to the outside of the building (simulating floodlights etc). But that's all stuff I could add at a later stage. I've applied a 'concrete' foundation by finding a suitable concrete pattern on the internet, scaled it down into strips and printed it out on a colour laser printer at work, and glued these to the structure base using PVA glue. Next I used a black craft paint (same stuff they use at pre-school etc) to paint the roof, and sprinkled on Woodlandscenics B76 cinders ballast while it was still wet. It will be followed by a layer of diluted PVA glue to further fix it in place. Have you checked out Unit models? They have a good range of ventilation and other detail parts, many are HO. Thanks Mike, I didn't know about this company, it seems indeed they have some excellent detail items for a variety of uses. I've bought quite a few of their products, not used too many yet, but I when get around to finishing some of my buildings they will be there! The castings have very little flash, with no pockmarks and good detail. Beware gluing the beautifully printed and weathered concrete base sections with PVA - in my experience they will part company, especially when there is any dampness in the air. I tried the same thing but have now used double sided tape from Michaels in the USA (Killer Red as Jack Burgess calls it) and a permanant spray glue from Hobbycraft. So far so good - and all my stuff is out in a log cabin in the garden.